Native American Kachinas have a rich and varied history beyond the fact that they are most often recognized as wooden, carved dolls. 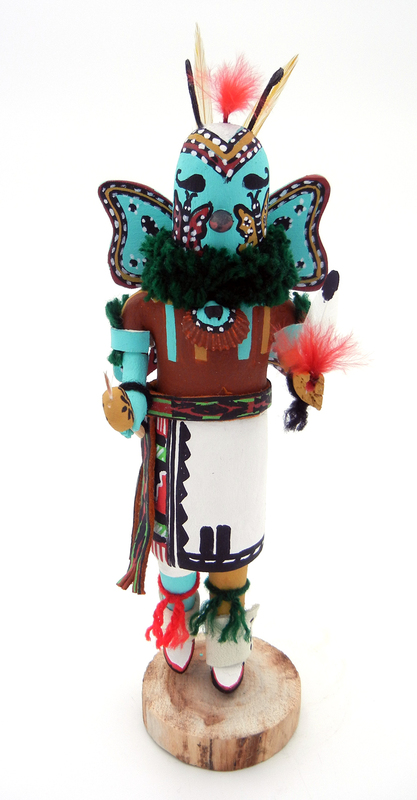 The “original” kachinas were supernatural spirits and beings. These mostly benevolent entities once lived among the Native American people and taught them basic living skills for well-being. These skills included how to hunt and make tools and other artifacts, how to live in harmony with nature so as to bring rain and fertility to the ground, how to heal sickness and measure out discipline and finally, the art of offering spiritual gratitude. When these “original” kachinas left the pueblos, they imported their gifts to the people, who still carry on their traditions to this day. At the time a pueblo dancer assumes the masks and costumes of those “ancestral beings,” he is thought to imbue the power and characteristics of that particular kachina, however, he is not looked up to as a god, and is instead merely a symbol of one of the original kachinas. Each kachina, then, has a specific function and is believed to be the spirit of an animal, bird, plant, object, place or person. 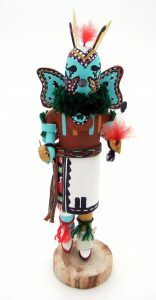 Originally, the kachina doll was devised as a teaching tool given to children as part of their cultural and religious training. It is estimated that there are more than 250 kachinas, with several new additions occurring periodically.